For decades, fat has been vilified as the number one enemy in our diet. Supermarket shelves are packed full of low-fat alternatives, but it's now becoming clear that sugar is causing just as many issues with our health, if not more. 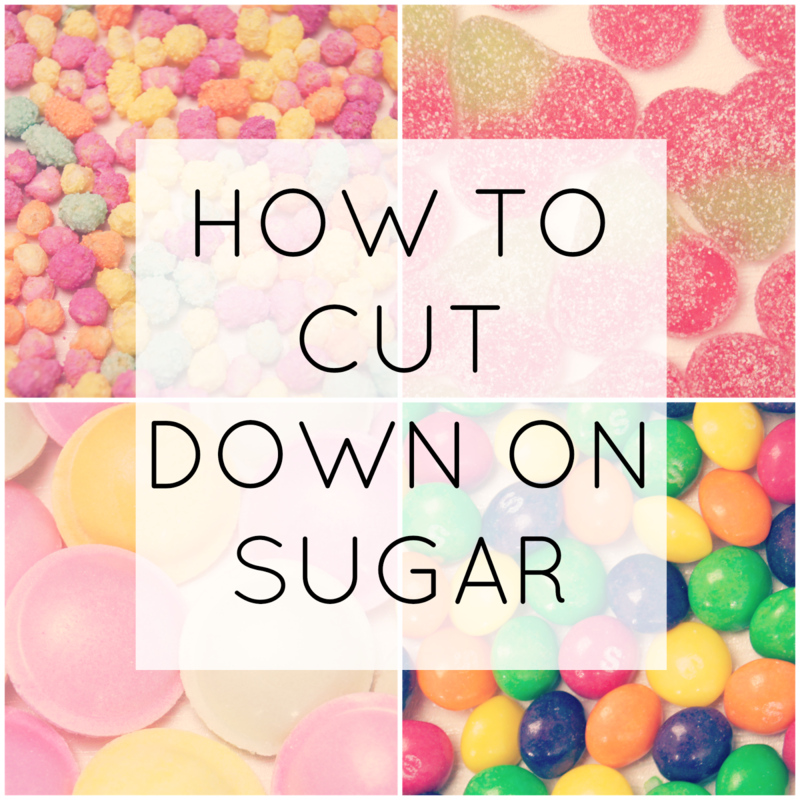 Over the past, few years I've really been trying to cut down my sugar intake, so I thought I'd share some tips on how I've done it, without sacrificing my sweet tooth. Now, I like to eat out and I love having treats every once in a while, so my diet isn't totally sugar-free. I'm in no way perfect when it comes to clean-eating. Moderation is key and, if you reduce your intake as much as possible, then occasional lapses aren't life-threatening. It's making sugar binges a regular occurrence that's dangerous. The white stuff is widely known as having an awful effect on both the body and mind, making your blood-sugar levels rocket and then crash, leaving you tired, irritable and looking for another source of quick-release energy. It's the one food that has no nutritional value whatsoever: no protein, healthy fats, vitamins or even enzymes. Eating sugar triggers feel-good brain chemicals being released into the system and binging on it can lead to addictive tendencies. Once you stop eating it, your body can experience withdrawal symptoms, including headaches, mood swings and cold sweats. Does that sound like a drug, to you? I certainly think so. So, how do we stop ourselves from giving in to temptation? Sugar seems to creep it's way into everything nowadays and it's difficult to keep track of how much you're actually eating. Unless you look at the labels on the back of every item that you buy, then you could be completely oblivious to just how much is in our everyday essentials, such as bread, baked beans, condiments and even supposedly healthy products. 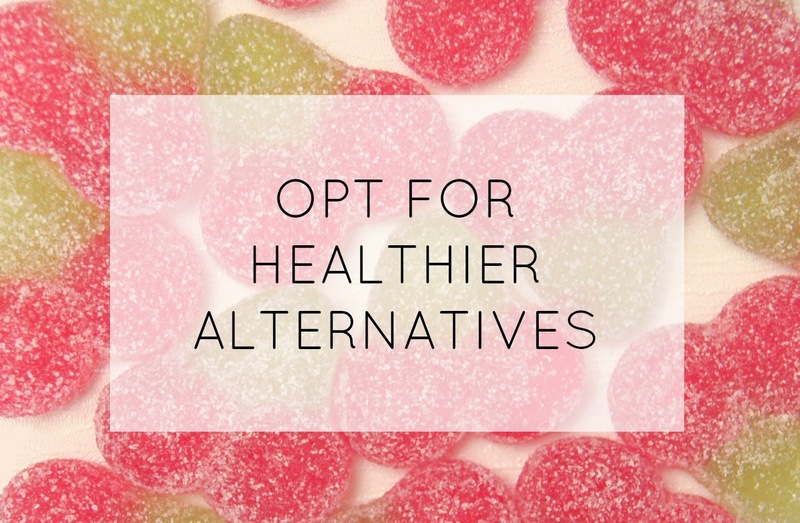 Although it might mean that you spend an extra ten minutes in the supermarket, have a look at the labels of the food you purchase and see if there's an alternative with a lower, sugar content. And whatever you do, don't go grocery shopping when you're hungry! 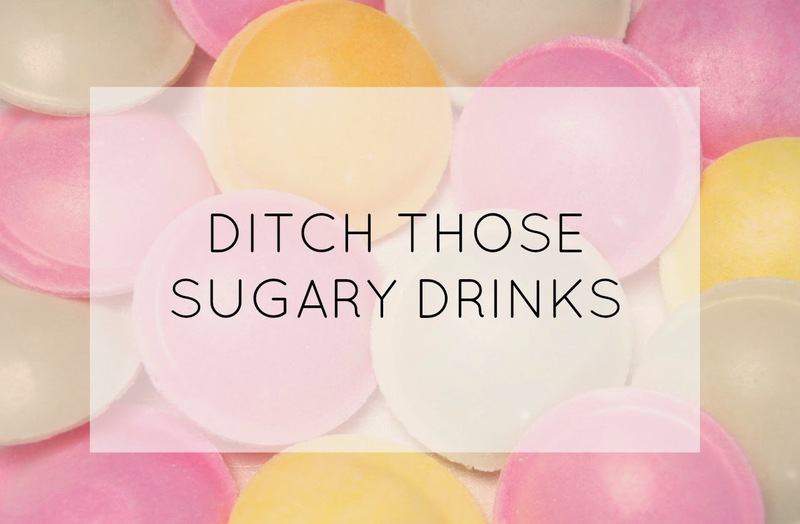 The one method that really helped to kick-start the reduction of sugar in my diet, was to break bad habits and gradually cut down the amount of sugar I automatically added to my food and drinks. Start by limiting how much sugar you sprinkle into to things like hot drinks and cereal, for example. 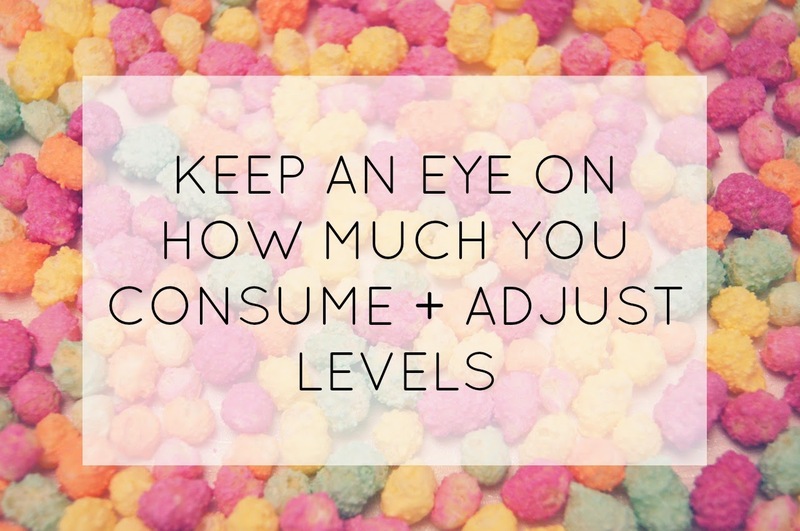 By slowly reducing the amount you have a little at a time, your body will gradually adjust and soon you won't notice a difference in the taste. When I say sugary drinks, the main culprit is fizzy soda. No, the odd glass of lemonade every now and again won't do major damage, but if you count these drinks as a necessity in your diet, then you may want to consider curbing your habit and preferably giving them up completely. With around 10 teaspoons of sugar per can of Coca-Cola, these drinks are deceivingly bad for you and are classed as empty calories. Not only can they cause painful bloating, but have you seen what fizzy drinks can do to a dirty penny? Would you really want that happening inside you? Watch out for drinks which appear healthy, but contain far more sugar than you'd think, like fruit-flavoured waters or juices. Fruit juices may not seem as bad for you as other sugary drinks, but without the bulk fibre and nutrients that are lost during processing, you're essentially just drinking the fructose which will be easily absorbed by the body. Smoothies, when blending the whole fruit and vegetables, still contain that crucial fibre, but eating fruit whole is best for giving a slower release of sugars and preventing all of them being absorbed by the body. Instead of reaching for fizzy drinks and fruit juices, I like to make my own drinks at home. Water infused with fresh fruits like lemon, strawberry and kiwi, fruit and vegetable juices/smoothies (using mostly vegetables), green teas and herbal teas are all great alternatives. My favourite teas are the Twining's Green Teas, which come in a variety of flavours, such as Mango & Lychee and Peach & Cherry Blossom. I also love Taylor's Teas, with the Sweet Rhubarb version being my all-time favourite. 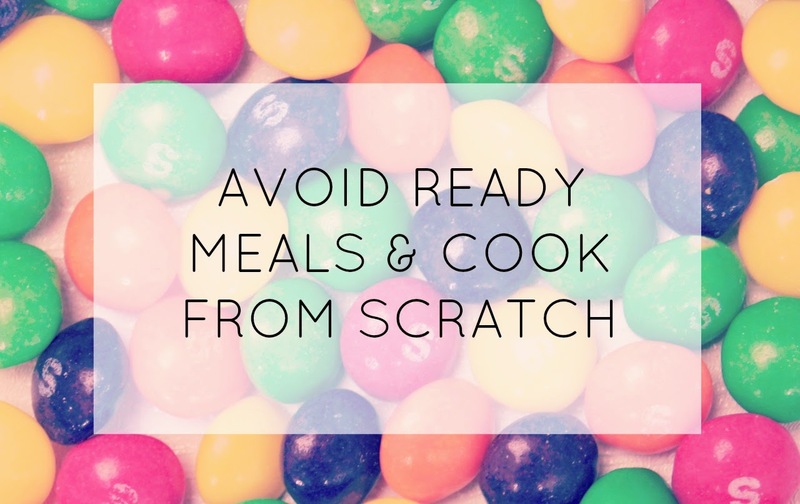 With our lives becoming ever more rushed and busy, cooking meals from scratch can seem too time-consuming and difficult. Yes, ready meals are much more convenient, but the amount of sugar, salt and saturated fats in them are so detrimental to our health. Plus, the portion that they give you for one serving is, more often than not, absolutely minuscule, leaving your stomach half-empty and craving more. With a little forward-planning, cooking from scratch doesn't have to take over your life. You have total control of what you put into your meals and you soon realise just how artificial pre-prepared, packaged meals taste, in comparison. To prevent a panic when it comes to seven o'clock and your plate is bare, plan your meals in advance for the upcoming week. Then, make sure you schedule in the time for cooking and, if you are short on minutes, choose quick dishes for busy days. Cooking in bulk when you have some extra time and then freezing separate portions is a great way to stock up and avoid that 'no-time' excuse, too. Simply defrost and re-heat. One of my favourite books for sugar-free cooking is I Quit Sugar For Life by Sarah Wilson, which includes a sugar detox plan and is jam-packed with tasty meal and snack recipes, suitable for the whole family. I've got a whole load of twenty-minute recipes that I cook regularly, so if you'd like me to share any of them with you, then give me a shout in the comments. If you have a particularly sweet tooth, like me, then it can be difficult to go without desserts and deprivation isn't something I agree with. Instead of denying myself the pleasure of eating chocolate brownies and ice cream all together, I like to find ways of making a healthier version of them. Blending a frozen banana with some vanilla extract and cacao powder makes the most delicious, rich ice cream, for example. It can be done and there are lots of bloggers out there, including Madeleine Shaw, dedicated to creating nutritious recipes that help a healthy diet become a way of life, rather than just a fad or brief phase. When baking, try swapping refined sugars for more natural alternatives, such as 100% natural Stevia (be careful - there's a lot of fakers out there), Coconut Sugar and even Honey (in unprocessed form). Although they're still technically sugars, these variants include more nutrients than regular, table sugar and have a lower glycemic-index, providing slow-release energy that is used up by the body, rather than being stored as fat. Limiting how much of these sugars you eat is still important and healthier desserts still need to be classed as a treat, though. Some of my favourite, healthy treats to satisfy those cravings, for when I want more than just some strawberries and coconut cream, are popcorn drizzled with dark chocolate (as high a cocoa content as possible), apple slices with peanut butter, medijool dates or greek yoghurt with home-made, stewed fruit (rhubarb and plums are particularly delicious). Opting for savoury, sugar-free snacks, such as nuts or peanut butter can also help fight cravings, without giving in to saccharine seduction. Are you concerned about the amount of sugar in your diet? Do you have any tips for cutting-down your intake? I'm try to cut down on sugar at the moment in hopes my skin will calm down, thanks for these tips! Ohh dear, I would hate to know how much sugar I eat. I am good with everything else, (fats, carbs etc) so I need to take a few of these tips on board! These are such great tips! 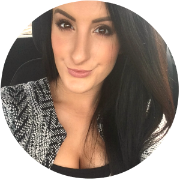 I think little lifestyle changes like you mentioned in the posts are the absolute keys. I try to avoid soda and ready-made meals. What a great post! I love the tips! I'll keep these in mind! good tips! i don't really eat much sugary stuff but i could definitely make more of my own meals. I definitely need these tips in my life! I am such a sweet tooth and I will often find myself craving sugary goodness!